We've compiled a list of our favorite Disneyland hidden gems. These aren't major things - just little touches that add sparkle to any visit to this whimsical and wonderful place. Our travel agents who specialize in Disneyland can add sparkle to your vacation. Click here to find out more about the services we offer at no extra charge. One of the things that makes Disneyland so special is that it is the only theme park that was built with Walt Disney's involvement at every level, from original inspiration to attraction design to opening day and beyond. He first had the idea as he sat on a park bench watching his daughters ride the merry-go-round at an amusement park and he had the thought that there should be a place where parents and children could enjoy doing things together. It was an idea that stuck with him and one that took a lot of time to develop but Disneyland opened 15 years later. Walt's Bench: One of the hidden gems you'll find tucked away in an exhibit near the front of the park is the bench where the first thought of a theme park came to Walt Disney. Walt's Lamp: Did you know that Walt Disney had a small but fully functional apartment built into the second floor of the Disneyland Fire Station? This apartment isn't open to the public though you can sometimes peek into it in the "Walk in Walt's Disneyland Footsteps Guided Tour" (extra cost). The story goes that Walt would put a lit lamp in the window of the firehouse window to let people know he was in residence. They now keep a lit lamp in the window to symbolize the idea of Walt's influence or spirit always being present at Disneyland. Lamp in the window of the Disneyland Fire Department that symbolizes Walt's ongoing presence in Disneyland. Disney Brothers Golden Initials: Look for Walt & Roy Disneys' golden initials in the railing above the Pirates of the Caribbean ride in the New Orleans Square area of Disneyland...really, it is maybe a little closer to the Gumbo stand. Walt Disney's and Roy Disney's Golden Initials in the ironwork balcony in New Orleans Square, Disneyland. People often rush down Main Street U.S.A. and they miss some charming things like vintage vehicles, penny arcade "movies", classic Disney cartoons in the Cinema, live entertainment, and more. One of my favorite things are the Windows to Enchantment at the Emporium Gift Shop which feature scenes from classic Disney animated films that have mechanized elements that move or change as you watch. 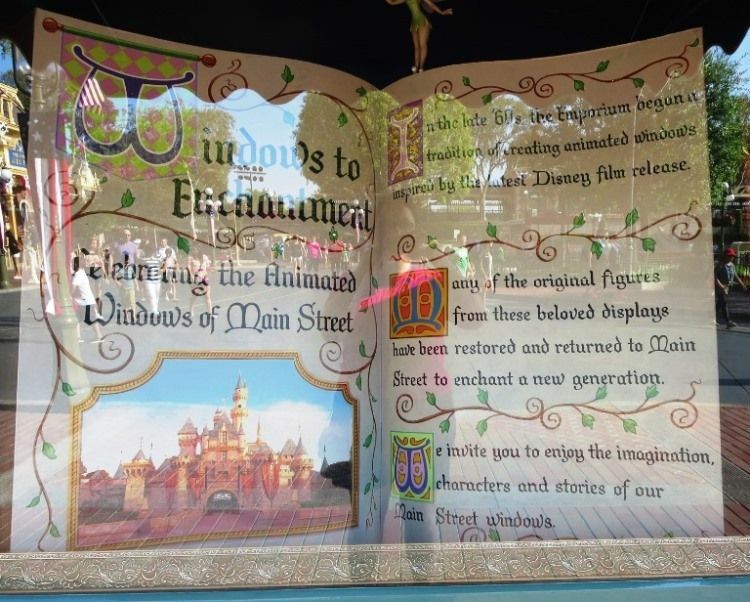 Windows to Enchantment - the Animated windows of Main Street USA. Moving displays in the windows of the Emporium that feature scenes from classic Disney animated films. Disneyland - California. Disneyland Railroad - Riding Tender: Be careful about getting your heart set on this next one because it isn't always possible but up to two guests can sometimes ride up front with the train’s engineer on either the C.K. Holliday (Engine #1) or the E.P. Ripley (Engine #2). To do so, you'll need to the Conductor at the Main Street Train Station if you can ride tender and, if it is available on the day of your visit, they will either let you ride or they will tell when to check back later in the day. Sleeping Beauty's Castle: Be prepared for the fact that the castle is MUCH smaller than the caste at Disney World. Your "in front of the castle" pictures will be better if you actually take them from the little trails to either side of the hub. Sleeping Beauty's Castle in Disneyland - Anaheim, California. Disneyland vs. Disney World Rides: If you've ever been to the Walt Disney World Resort in Florida, you may want to take time to note the differences between Disneyland & Disney World "it's a small world" and Pirates of the Caribbean. Many people feel these attractions are better at Disneyland. You should definitely ride "Toad's Wild Ride" as it doesn't exist at Disney World anymore. Ride in the front of the Monorail: Oh, this is HUGE!!! You can still ride in the front of the monorail at Disneyland even though this is no longer allowed at Disney World. Just let the Cast Member (Disney employee) at the entrance of the monorail know that you'd like to ride up front. There is a limit to the number of people who can ride and you may need to wait until the next monorail if someone else has already asked to ride. You will need a theme park admission ticket to ride and you can catch the train in Downtown Disney or Tomorrowland, in Disneyland. You can still ride in the front of the Disneyland monorail. Theme park admission ticket required. Disney characters in ''it's a small world": They've tucked stylized versions of Disney& Pixar characters into the "it's a small world' ride at Disneyland. Some folks were outraged but I personally think they're cute. Look for Peter Pan, Tinker Bell, Alice and the White Rabbit, Cinderella, the Little Mermaid, Pinocchio and Jiminy Cricket, Aladdin, Jasmin, Abu, Mulan, Marlin and Dory, Lilo and Stitch, Woody, Bullseye and Jessie from Toy Story, the Three Caballeros and others. Woody & Bullseye from Toy Story. "it's a small world" at Disneyland has stylized versions of Disney characters tucked into the displays. "it's a small world" clock: One of my favorite things about "it's a small world" is that the clock front opens and little international characters come out on the hour and half hour. You may be a little surprised to learn that it is actually a digital clock! Did you know? Each horse in the Fantasyland carousel has a name and you can get a list of the names by stopping in at City Hall. You can also ask a Cast Member in the ride loading area of the Jungle Cruise for a free souvenir map of the attraction, though they might ask you to tell a joke as payment. Did you know that you can often get a free souvenir map of the Jungle Cruise in Adventureland at Disney World. Just ask a Cast Member at the loading area. When A Problem Comes Along, You Must Whip It: Is there a long line for Dole Whips (pineapple frozen soft-serve) in Adventureland? If so, go inside the entrance to the Enchanted Tiki Bird show, the line is often shorter on that side. Look for free recipe cards in a rack on the counter. Dole Whip & a Free Recipe Card near the Enchanted Tiki Birds in the Adventureland area of Disneyland. Two of our Favorite Disneyland Treats: You can get two of our favorite Disneyland treats at the Mint Julep bar in New Orleans square. This is a large order of the Mickey Mouse beignets sold and a mint julep. The mint juleps are non-alcoholic and perhaps a bit too sweet but anything this shade of green with mint, lemons, and cherries tucked into has to be good. You can also get mint juleps with your meal inside the French Market. If you can find a table, you may be able to enjoy some wonderful live music. Some say that the beignets at the Jazz Kitchen in Downtown Disney are better but they are not Mickey shaped and that settles that! Mickey Mouse beignets from the Mint Julep bar in New Orleans Square at Disneyland. Golden Horseshoe Food Tip: We didn't care for the food options at the Golden Horseshoe Stage, a quick-service restaurant with chicken strips, fish and chips, and chili but we did want to eat lunch while watching the comedic Western show. We got our food at the nearby Riverbelle Terrace which is a quick-service location for lunch and has a lovely selection of sandwiches, soup, salads, and other items and brought it over the Golden Horseshoe to eat while we watched the show. Planning a Disneyland Resort vacation? You'll definitely want to subscribe to our free newsletter. You will receive our 45 great Disney World Freebies, several helpful “how-to” e-guides, and the latest Disneyland Resort information as it is released. Unsubscribe at any time. Important FASTPASS Tips: Get your Radiator Springs Racer and World of Color FASTPASS tickets as early in the morning as possible. They're often all completely distributed by mid-day. The great thing about the World of Color FASTPASS is that it is a bonus FASTPASS that doesn't have any type of time restriction to prevent you from getting other FASTPASS. Get to World of Color early, even with a FASTPASS, and get front spots though you should know that you'll be covered with a fine mist of water at various times throughout the show! There are World of Color dining packages where you dine at a specific restaurant earlier in the day and you receive guaranteed seating for the show. Trivia: You'll see Neil Patrick Harris in World of Color - Celebrate! The Wonderful World of Walt Disney but did you know that he is also the voice of the countdown at the beginning of the California Screamin' roller coaster? Try Before You Buy: In Carsland, the Cozy Cone area has snacks and there is a "Popcone" that always has a seasonal flavor. When we were there, the seasonal flavor was "Dill Pickle". They gave us a free tasting sample so we could try before committing. Two of us liked it and two of us thought it was awful. Red's Apple Freeze: If you like LaFrou Brew or Butterbeer (Magic Kingdom & Universal Orlando), you might want to try Red's Apple Freeze in Cars Land. You don't have to buy the souvenir glass; it is available in a regular cup. Free tasting sample of Dill pickle flavored popcorn from the PopCone in Cars Land at Disney California Adventure park / Disneyland. The Sort-of-Famous Disneyland Cats: This is one of those things that sounds like an urban legend but isn't....Did you know that there are a bunch of feral cats that live at Disneyland? It's true. You wouldn't think Mickey Mouse would approve but the cats help take care of rodent issues. There may be as many as 200 cats that live at Disneyland and are fed, are spayed or neutered, and receive necessary veterinary care in exchange for their services as "natural exterminators". Disney uses feeding schedules to minimize the cats' interaction with park guests but you so sometimes see them in the parks. I saw this pretty calico cat near the Grizzly River Run attraction at Disney's California Adventure. Learn to Draw: I'm not sure how hidden this is since it is listed right in the park map but a lot of people pass by and never try one of the Animation Academy mini-classes that are completely free and offered throughout the day. Stadium style seating allows you to see everything that the animator does on a large, overhead screen as he or she takes you step-by-step through the process of drawing a Disney character. Paper, a drawing pencil, and a writing surface is provided and you get to take home your drawing making this a very special souvenir because it was created by you. Small children and perfectionists may get frustrated with this activity but lots of people have so much fun that they do multiple sessions. The Cast Member at the entrance will be able to tell you which character is being done in the next class. The Animation Academy is one of the really neat things at Disney California Adventure. You'll learn to sketch a Disney character at the mini-classes, included with park admission, offered throughout the day. Trader Sam's is a little gem found over at the Disneyland Hotel (everyone is welcome) that isn't so hidden any more. Trader Sam is the head salesman from the Jungle Cruise attraction in Disneyland; you may recall his offer to give you two of his heads for one of yours. Well, it seems that he also owns a traditional tiki bar which features some food items and some really great memorabilia. Select pieces of that memorabilia may move or change when certain beverages are ordered from the bar. Children are welcome prior to 8:00PM when accompanied by an adult; guests must be 21 or older with ID to enter after 8:00PM. 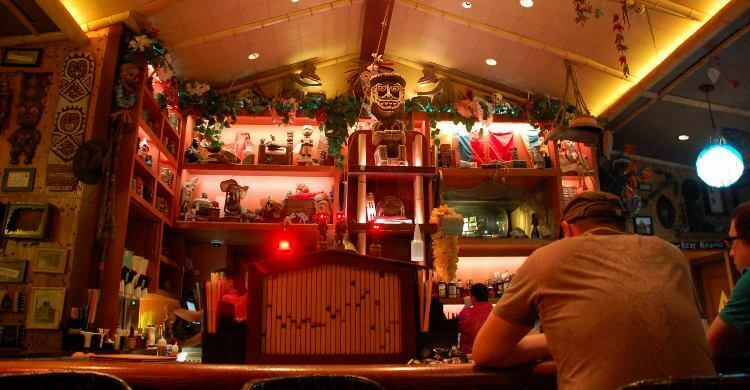 Trader Sam's Enchanted Tiki Bar at the Disneyland Hotel in California. If you've been enjoying these hidden gems and tips, you are probably beginning to see how helpful and valuable it would be to have someone who really knows and loves Disneyland help with your trip. Did you know that our travel agents that specialize in Disneyland add a lot of value to your experience without costing you any extra? When you book through us, you receive advice and information to help make your trip a wonderful and memorable time as well as a handy guidebook or online subscription (your choice) at no cost to you that will help you stay ahead of crowds and out of long lines. We book both Disney and non-Disney hotels and we love helping our clients have a great trip. Contact us today with your questions or to get a free, no-obligation quote.